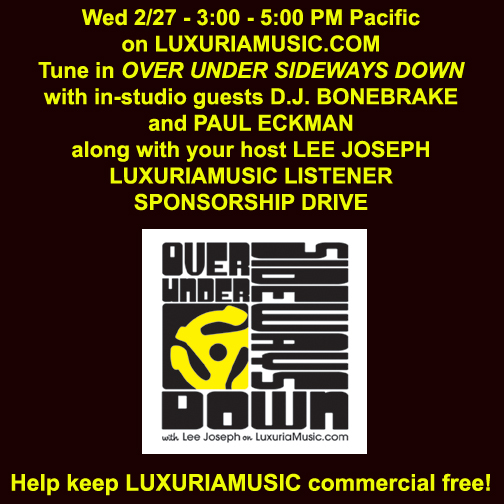 On Wed., Feb 27 at 3 – 5 PM Pacific, my in studio guests on Over Under Sideways Down – LuxuriaMusic.com during Lux’s Listener Sponsorship Drive will be D. J. Bonebrake and Paul Eckman both in Orchestra Superstring who have released two CDs and one LP on Dionysus Records. We’ll be asking you to support commercial free LuxuriaMusic.com while we talk about and play tracks from D.J. and Paul’s many bands. We will also be making available a copy of Orchestra Superstring’s Kalopia signed by both D.J. and Paul for a lucky Listener Sponsor or two! Tune in! Orchestra Superstring featuring X’s D.J. 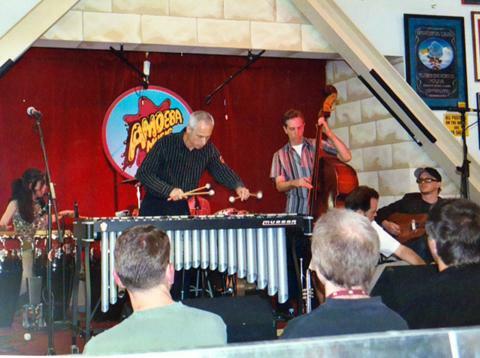 Bonebrake on vibes performs Cal Tjader’s “Mamblues” at The Speakeasy in Venice, CA on Feb 13, 2012. This song is not on either of Orchestra Superstring’s Dionysus albums – enjoy! Orchestra Superstring is performing at the Del Monte Speakeasy in Venice, CA – Sunday February 12th at 9:30 pm. The group will be playing their special mix of Latin inspired jazz and exotica with DJ Bonebrake on vibes, Mike Bolger on trumpet + keyboards, Danny Frankel & Debra Dobkin on percussion, Woody Jackson on guitar, and Paul Eckman on bass. The Speakeasy is located underneath the historic “Townhouse” at 52 Windward Ave,Venice, CA, 90291. Come down to the beach and enjoy the evening Orchestra Superstring!